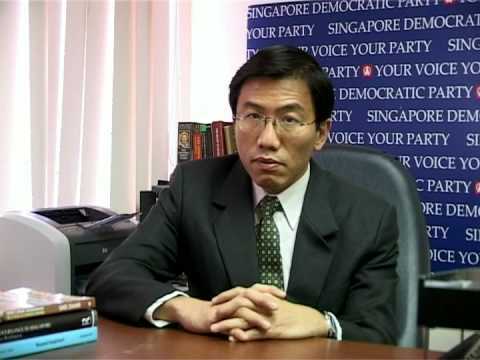 This dude just psycho-analysed the shizz outta SDP’s Chee Soon Juan’s Unemployment Insurance so you don’t have to. 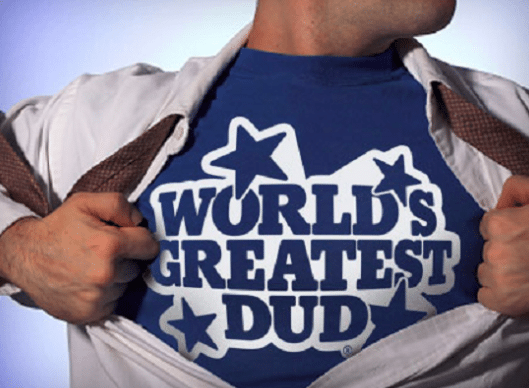 “dud”: a thing that fails to work. First 6 months of unemployment: 75% last drawn salary. Next 6 months, 50% last drawn. 3rd 6 months: 25% last drawn. 80% funded by the state. I was curious. If this was a private business, which insurance company would pick this up? Those who are familiar with insurance will know that it is a matter of profitable statistics in order for the company to be sustainable. Hence it doesn’t come as a surprise that in all the countries listed above, they are all state programs. Which means, it is not profitable, nor is it sustainable as a business. Only the government is capable of running such a program which in fact, is a handout safety net for the unemployed. Q: honestly, if you are currently earning $8,000 a month, about to lose your job, and knowing that you will receive a handout of $6,000 for the next 6 months, that you will wake up early tomorrow to start tidying up your resume and search through JobStreet? A: I would mostly likely be planning my next holiday and don’t intend to get a job for the next 6 months. my immediate unemployment plan – um… redecorate? I know because I was not earning an income for 2 years and was surviving on my savings, my wife’s salary, while providing for two kids. The urgency is just not the same if you know you have ZERO income coming in, versus if you have a 75% payout coming in. I am not quite sure how Chee measures success. Below I am going to list out the unemployment rate of some countries with UI as well as their tenure of payout. Japan: 3.3% Payout max 80% 1.5 – 6 months. I am really curious what kind of Math did Chee do, to come up with a plan that lasts 18 months (that is 80% more than Canada! ), and starts with 75%? we need to think what kind of culture do we want for ourselves and for our future generations. We are digging into reserves meant for them. Our children is going to see us unemployed, and not be anxious about it because the state will give us handouts. They will grow up to think the same. For a country where our human resource and reserves are our only resources, do we really want to “Live it up Now” and break this culture of hardworking-ness that our forefathers have fostered over the years? I know Chee’s supporters will argue that this is only at the ideation stage, naturally it won’t be worked out. But for a MP Candidate, you have to come up with numbers that are more viable! I barely spent an hour to dig up all these stats. Surely your team can do better. 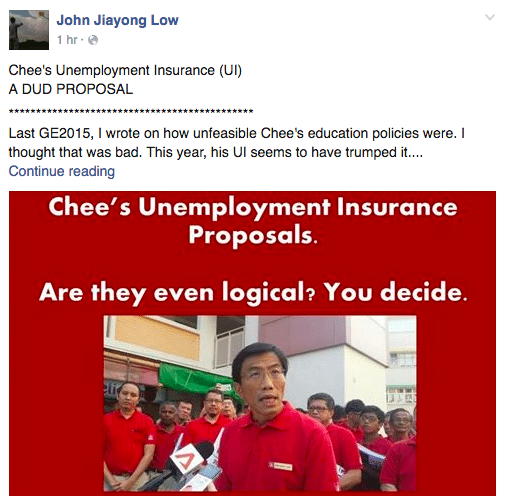 Last GE2015, I wrote on how unfeasible Chee’s education policies were. I thought that was bad. This year, his UI seems to have trumped it. Chee’s proposals can be found here. His objective is to want to help the retrenched “tide” through the tough times. 1. Similar policies in other Asian Countries like Hong Kong, Taiwan, South Korea and Japan. 2. 1st 6 months of unemployment: 75% last drawn salary. Next 6 months, 50% last drawn. 3rd 6 months: 25% last drawn. 5. Funded 80% by the state. Wow! 75% income for 6 months! And at a cap of $8,700. That is freaking a lot. Sure there are conditions such as proof of trying to get a job, but most of them are just maintaining a list of companies you sent resumes to. Can anyone tell me honestly, that if you are currently earning $8,000 a month, about to lose your job, and knowing that you will receive a handout of $6,000 for the next 6 months, that you will wake up early tomorrow to start tidying up your resume and search through JobStreet? I would mostly likely be planning my next holiday and don’t intend to get a job for the next 6 months. See where this is going? Humans are lazy by nature. With such a comfy safety net, I will be resting there, and not trying to get a job. Oh but wait! We cannot reject more than 3 job offers? Whatever happened to the freedom that you preached? What if the 3 job offers are not suitable and I just need a little more time to land a suitable job? In retrospect, it seems like Chee feels he is not confident in securing 3 suitable job offers for individuals efficiently and hence want to have up to 18 months to “find” job offers for them. But the other countries are successful! Are these figures designed to help the individual get back to work ASAP or to let them be unemployed comfortably? Even without a mustache, Chee looks more like Santa Claus than Mr Murali. At least Mr Murali’s figures are more realistic. He didn’t say things like I’m going to spend $10 billion dollars to change Bukit Batok into the next Disney land of Singapore. All these said, I can see why Chee’s proposal is popular. It delves into the reserves which is Ah Kong’s money to ensure we go into unemployment comfortably. But we need to think what kind of culture do we want for ourselves and for our future generations. We are digging into reserves meant for them. Our children is going to see us unemployed, and not be anxious about it because the state will give us handouts. They will grow up to think the same. What I’m getting from everyone is, this is a good idea, but the quantum of the payout is wrong. And thats good imo. Means that we are thinking about policies, and not just rejecting them straight just cause they are from an opposition figure. Another point is, a functioning Parliament would scrutinise the plans, decide the quantum is wrong, and adjust accordingly. But our problem right now is no one is proposing such ideas or policies. In fact, theres not even much debate as firstly, an overwhelming majority of MPs are from a single party, under the governance of a Party Whip to ensure voting goes the way as decided by the party leader. Secondly, and perhaps more alarmingly, large absenteeism is frequently seen in Parliamentary sessions. How then, do we debate and propose policies to benefit the country as a whole? I say, vote him in, let him propose his ideas (many of which are good imo), and either debate and adopt them with amendments, or counter propose a better one, or even to shoot them down. Just don’t let Parliament be a dud and/or rubber stamping body whereby policies are fast tracked with little to no consultation a la the Populatio White Paper.